Nostradamus Prophecy slot machine from Playtech is a game based on the French physician who apparently made so many correct predictions about future events. The game has 5 reels, 243 paylines and a very respectable max jackpot of 500x per line, which can result in some pretty big wins considering the number of lines. There is also a free spins bonus which gives you between 5 and 15 spins. 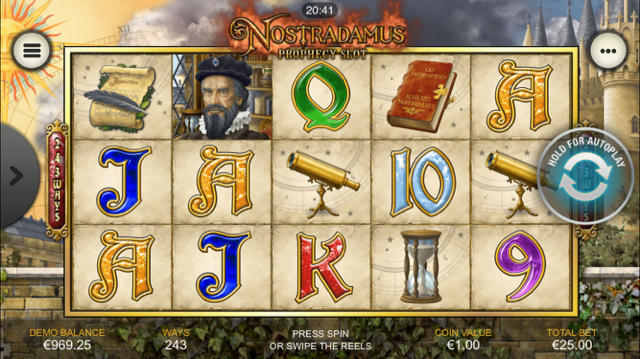 Check out the Nostradamus Prophecy slot review below. Taking its inspiration from the French apothecary and reputed seer, the Nostradamus Prophecy slot is a five reel, 243 ways to win title that’s far more consistent than most of its subject matter’s predictions. Originally developed by Ash Gaming, the slot features an old world theme with telescopes, hour glasses and quills on its reels and a background depicting a 16th century castle standing in front of a foreboding sky. Playable from as little as £0.25 per spin on all desktop, mobile and tablet devices, the game offers a diverse selection of bonus features that range from instant cash wins to modified free spins. Naturally, doomsday forecasts feature prominently in the bonus rounds, with a range of natural disasters randomly laying siege to the reels to trigger all manner of unique effects. A Planet Bonus will also see mobile casino players hoping that the stars align in their favour as they bid to win up to 555x their stake, while Nostradamus does occasionally pop up with good news in the form of random prizes. During the base game in the Nostradamus Prophecy slot machine, any one of three random disasters can strike to create huge bonus wins. An earthquake can cause an aftershock to tear through the reels and shake off all lower value icons, a lightning bolt can electrify the console and turn up to four symbols wild and a tsunami can sweep over the gameboard to turn between one and three reels completely wild. All three of these modifiers can also be selected manually during free spins feature, which is triggered whenever three or more globe scatter symbols appear anywhere on the reels. Landing three globes will award five spins with one disaster active, while four will provide 10 with a choice of two modifiers. Find five globes, however, and you’ll get 15 free spins with all three working at once. Additionally, the Nostradamus Prophecy slot also features a Planet Bonus that is activated whenever bonus symbols appear on reels one, three and five simultaneously. When this happens, players will be taken to a new screen where six planets will orbit the sun before coming to a halt. For each planet that lands on a special payline, players will receive an increasingly big prize, with up to 555x on offer. A hugely entertaining game that’s brimming with bonus features, you don’t need a seer to tell you that the Nostradamus Prophecy slot can substantially boost your bankroll if the stars align in your favour. Like the Nostradamus Prophecy slot review? Check out these as well…..